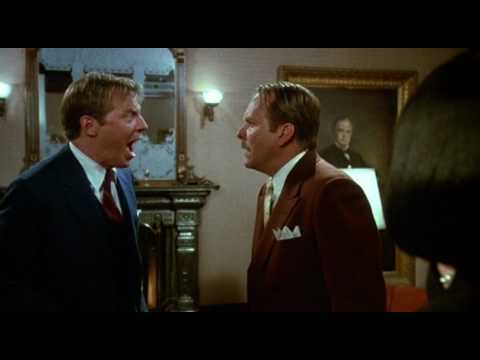 Clue the movie sported an amazing cast who were clearly having a ball with the film. Clue the board game was never very much fun. Riffing on the board game finale of declaring the murderer, location and weapon, the movie came with three alternate endings. Different theaters got different versions. Kickstarting a new edition of Cheapass Games's classic "Button Men"
I love playing clever puzzle games with friends and for years my go to company has been ThinkFun. They’ve just released a title with the claim of “teaching the basics of computer programming without a computer”. The designer of Code Master is an ex NASA virtual reality simulations programmer named Mark Engelberg and I think he’s hit his mark. 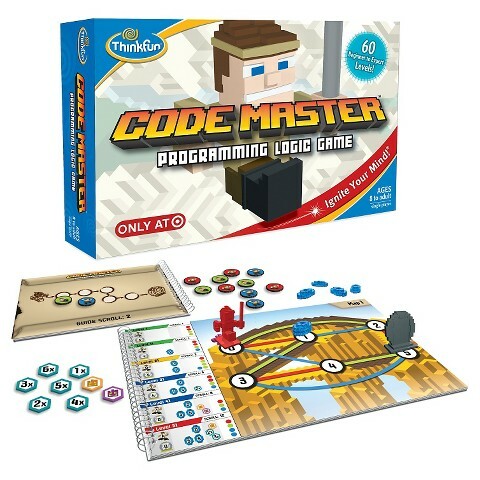 Like most of ThinkFun’s games, it comes with an ingenious, well-ramped set of levels that teaches new mechanics as you go. Even though the later levels are driving me batty, the “Huzzah!” moments encourage me to keep playing long after I should have gone to bed. You play the role of an adventurer who needs to collect gems on each level before escaping through a Portal. To aid you in your quest you’ll need to “write a program” that moves your hero across the map. 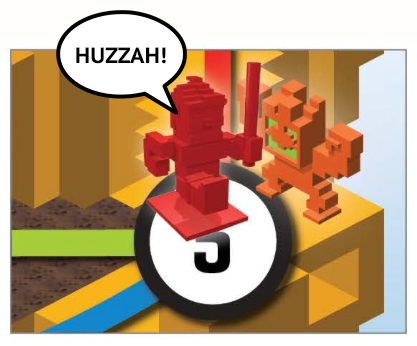 To write the program you’ll need to order a random set of movement tokens that allows your avatar to travel on appropriately colored paths. For the level shown above, you’re movement tokens are 1 red, 1 blue and 2 greens and must be placed in the following order to make it from start to finish. This particular level may seem simple but believe me – the game ramps to insane levels of difficulty! 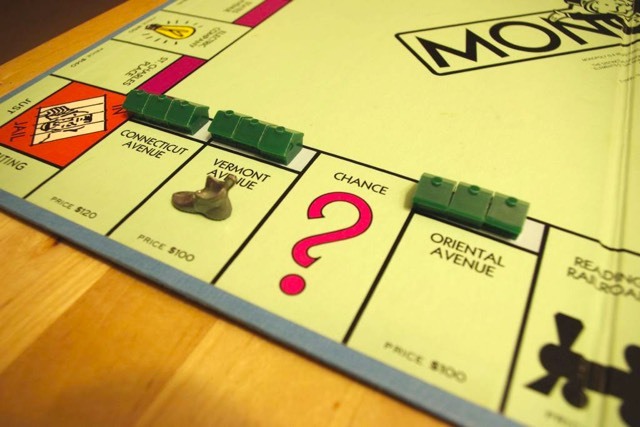 With a second monopoly completed, your next task is to improve those properties to three houses each, then all of your properties to four houses each. Six properties with three houses will give you more than half of the houses in the game, and four houses each will give you 75% of the total supply. This will make it nearly impossible for your opponents to improve their own property in a meaningful way. Keep the rulebook nearby once the supply gets low, as you will undoubtedly be questioned on it. At this point, you will be asked repeatedly to build some friggin' hotels already so that other people can build houses. Don't. At this point, you more or less have the game sewn up. If losing a normal game of monopoly is frustrating, losing to this strategy is excruciating, as a losing opponent essentially has no path to victory, even with lucky rolls. Your goal is to play conservatively, lock up more resources, and let the other players lose by attrition. If you want to see these people again, I recommend not gloating, but simply state that you're playing to win, and that it wasn't your idea to play Monopoly in the first place. King Ludwig II of Bavaria, having built Neuschwanstein, has tasked players in their role as builders to build him the most extravagant and amazing castle ever. You'll have both open and secret goals based on the king's desires, and every round, someone will take a turn as the master builder setting prices for the individual rooms that are available. If they're not chosen, they'll be discounted on the following turns. 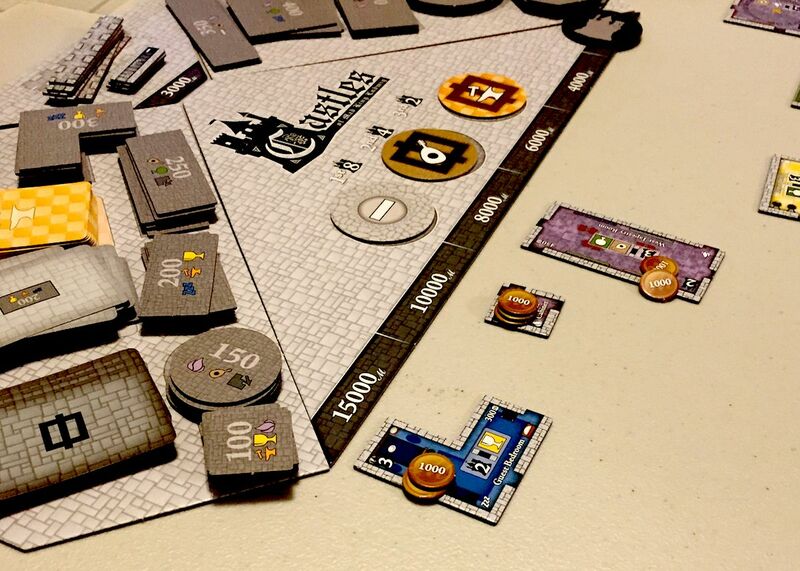 Castles of Mad King Ludwig is a superb game. 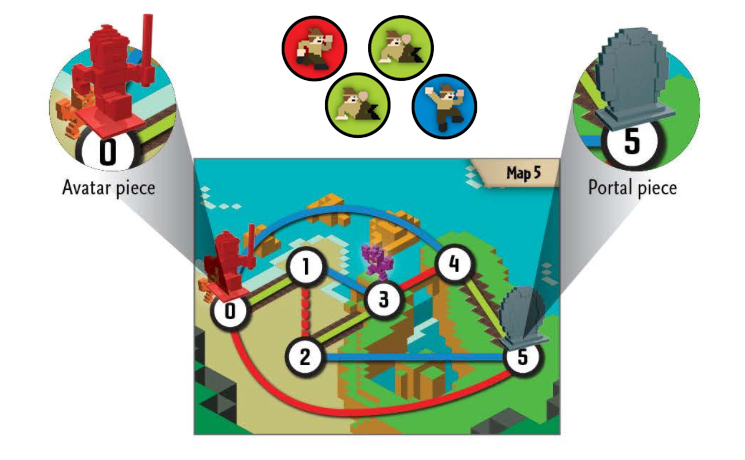 Not only are you having to juggle the layout to determine what you can place in your castle, but you must complete rooms by connecting other rooms to them to earn points and other bonuses. How you price the individual rooms is another strong element when you're playing the part of the master builder. You need to interpret what you think your opponents want to build, and put it just within their monetary reach, since you're paid any money they spend on rooms while you're the master builder. You'll end up with highly unlikely layouts in the quest to get all the rooms to fit into your castle. Trying to figure out what your opponents really want, and what bonus cards they might have is tough, particularly since more of them can be drawn during the course of play. After several rounds the game ends, and after points are awarded for the secret and the public goals, the most points wins. 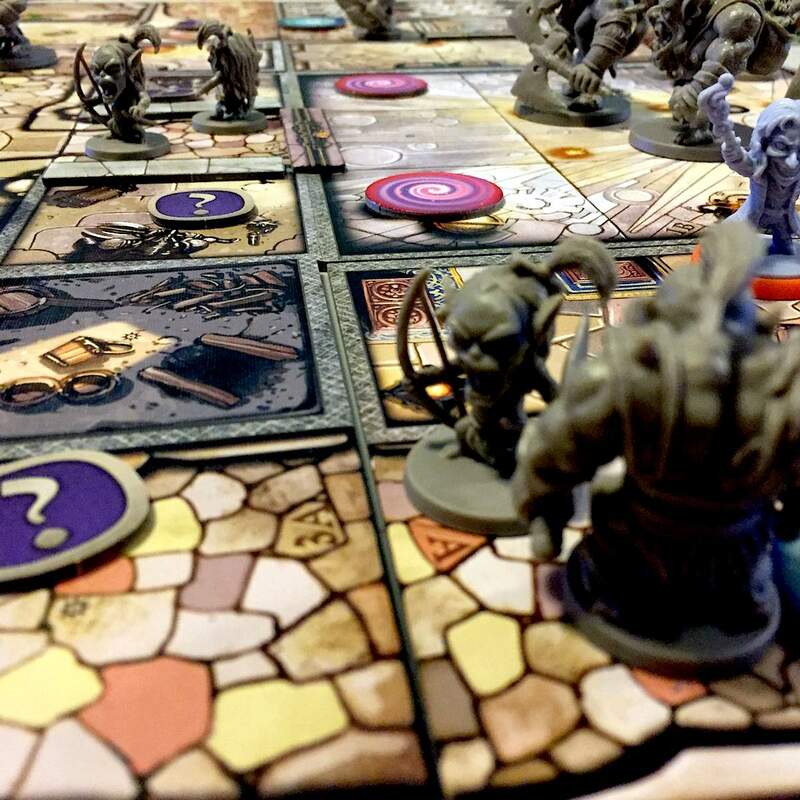 In Arcadia Quest, the mighty city of Arcadia has fallen to a foul vampire lord, Lord Fang, and his army of orcs, goblins and other monsters. They control the entire city, but the guilds of the city aren't going to take it laying down. There's loot to be had, and a throne to reclaim. The guild that does it sets themselves up in a position of power in the new regime. You'll guide a guild of three drafted heroes through six campaign-style missions with and against up to three opponents, attempting to complete objectives and gain power by fighting all comers. The miniatures in the game are exceptional, with the individual sculpts for the heroes being incredible. The game play is tense, too. You weigh pursuing goals with not wanting to rush in and get the objectives, only to have the opponent's fresher guild members come in right after you and take it from you. The scenarios are well balanced and the map design is set up to not favor any particular side. Being able to grow your heroes and build them up, getting better armor and abilities is exceptionally appealing. You'll build rivalries with your fellow players, but they still need your firepower to help complete the missions, or at least need you to not be at their flanks while they fight the monsters. Win the day, for Arcadia – and also fat loots, and power. 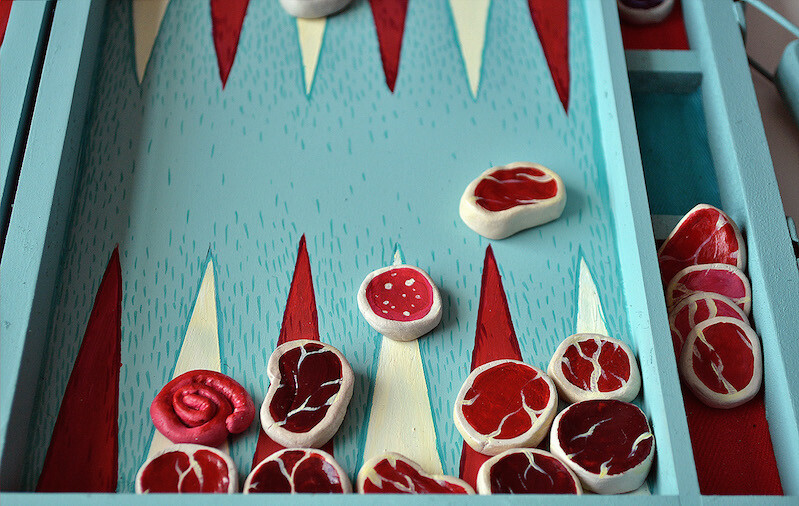 You’ll have tons of fun playing this well-balanced board game even if you never win - and I should know. 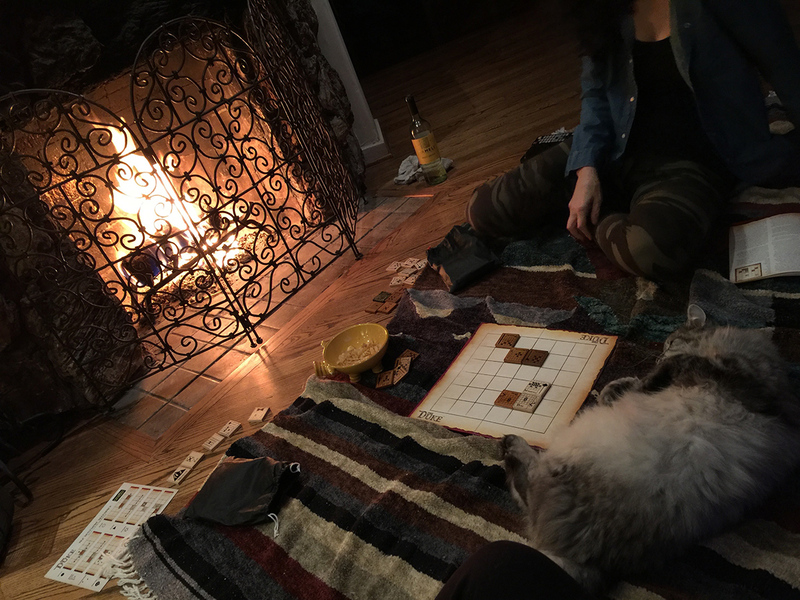 Getting my wife to play games with me is a bit like pulling teeth. 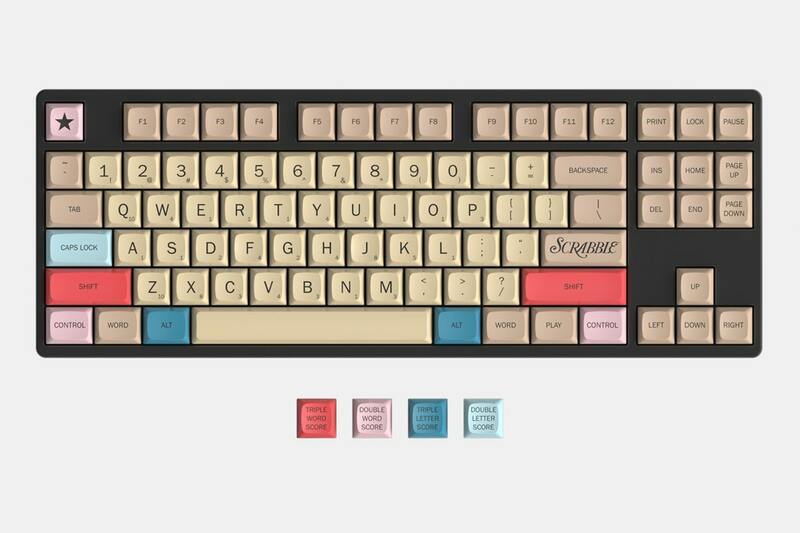 To increase my odds of making it happen, I normally promise to light a fire and make a cozy evening out of it. Here, you can see the lengths I went through last weekend to get my game on. 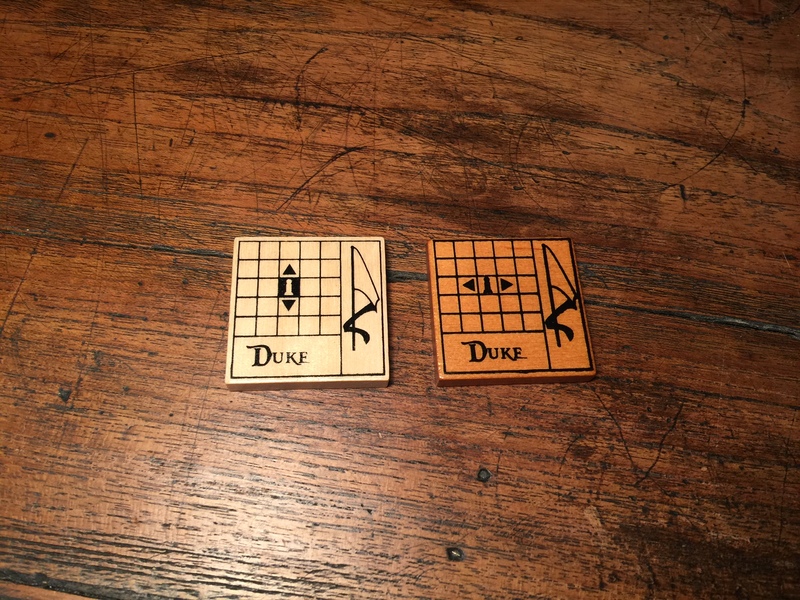 On this particular night, we played The Duke! 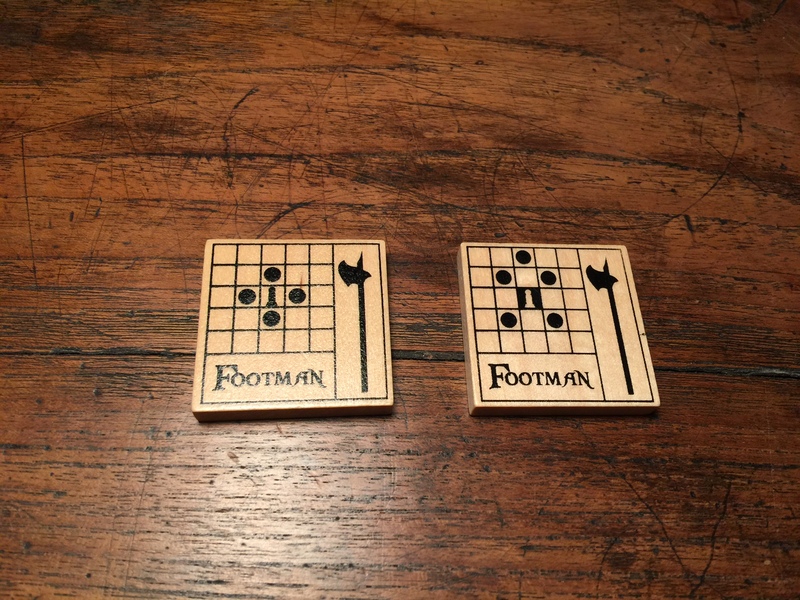 It’s a 2-player strategy game that takes place on a simple board of 36 squares. The game is a bit like chess – only better. The mechanics are constantly in flux and it forces you to think in a way that’s very different from other games. 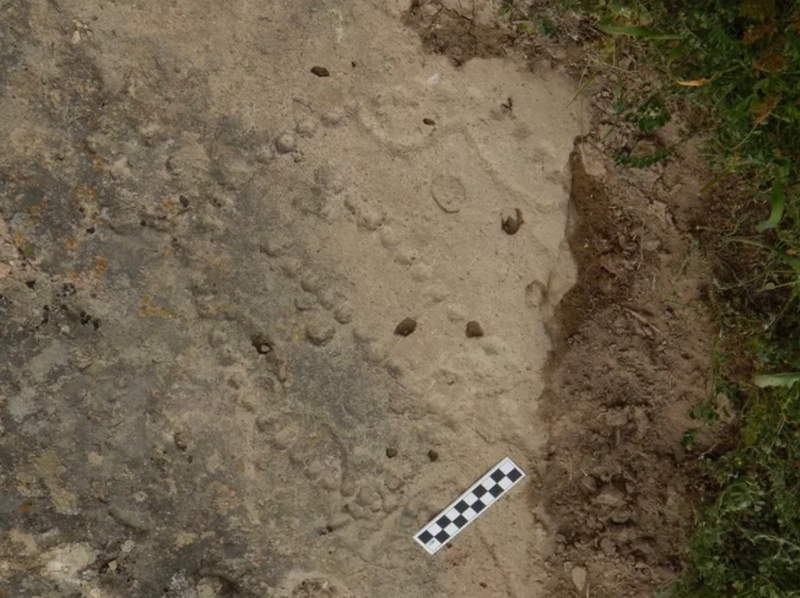 Like chess, players take turns controlling the movement of troops on the playing field. The player's movement options are graphically portrayed on the front and back of each troop but only the side that’s facing up is in play. Each time you move a troop, it's flipped and the movement rules change. Each player begins with 3 "stock" troops a sack of mixed wooden tiles that'll be chosen from later. Stock troop #1 - The Duke. He’s like the King in Chess. It’s important to keep him safe at all times because once he’s captured - you lose. 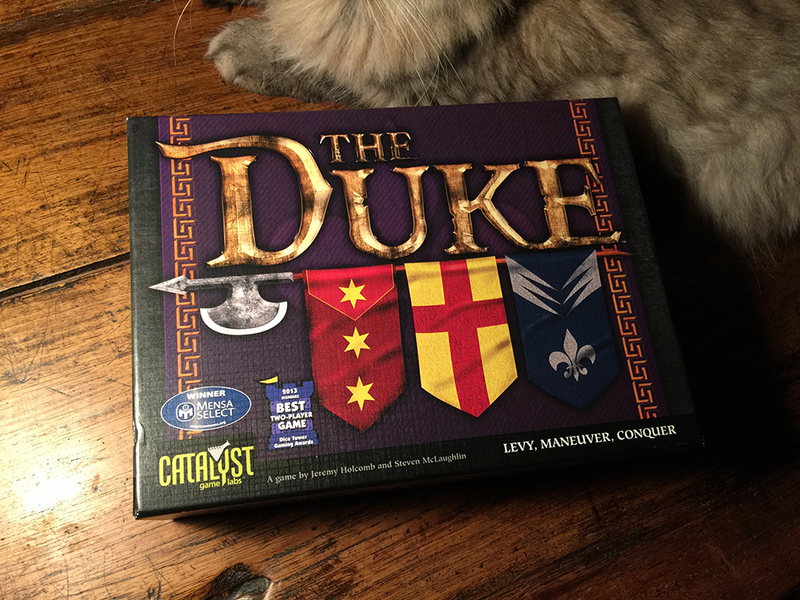 The Duke can move clear across the board like a Rook. 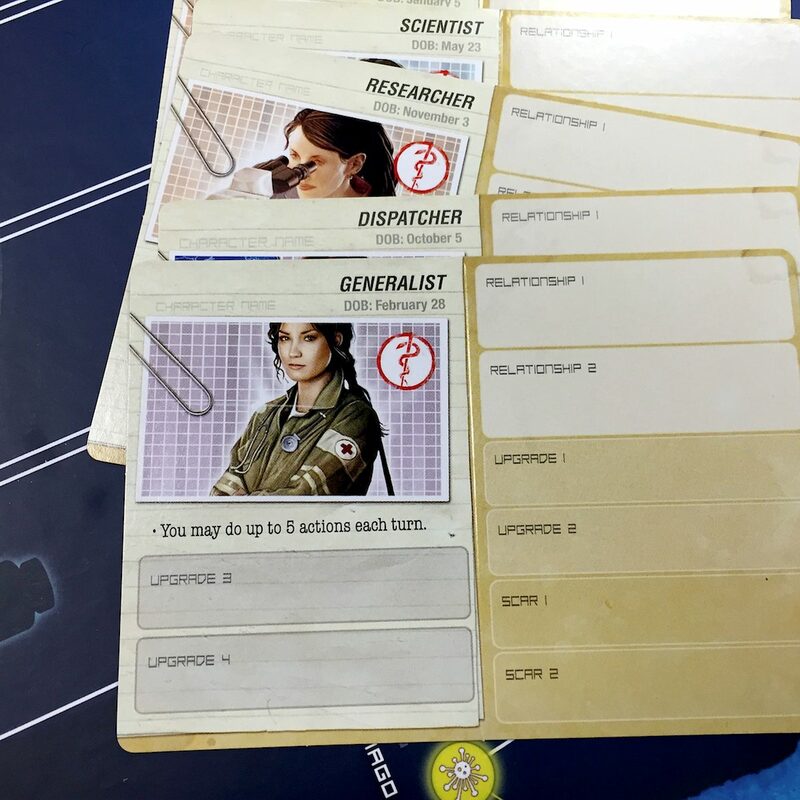 If you’re familiar with Pandemic then you’ve already got a handle on the basic game play of Pandemic Legacy. Fly around the world, cure diseases and save humanity. The first differences you’re going to notice with any Legacy game is the sheet of stickers, secret envelopes with little numbers and Advent calendar-like little packages in the main box. Pandemic Legacy takes place over the course of a really bad year for humanity. You’re going to be trying to save the world from four diseases, but this time, each individual game is going to affect the future ones as you place stickers on the board and the game changes permanently when certain events occur. We’ll not be going into spoilers here, but some of the common knowledge things that carry over from Pandemic as slightly changed are that when cities outbreak, the first one is free, but then they slowly spin out of control there, restricting travel to and from those cities, making it harder to move in and out. Also your role will be with you for the duration of the game, and being in a city when it falls means bad things happening to your character that’ll provide lingering effects. A cream pie in the face! It’s an ageless slapstick comedy routine that is also the inspiration for Hasbro’s Pie Face Game. Thanks in part to a viral video that’s making its rounds on social media, this equally ageless game is destined to be a hit this holiday season. Pie Face is as easy as pie to setup and play, although clean-up will be required. 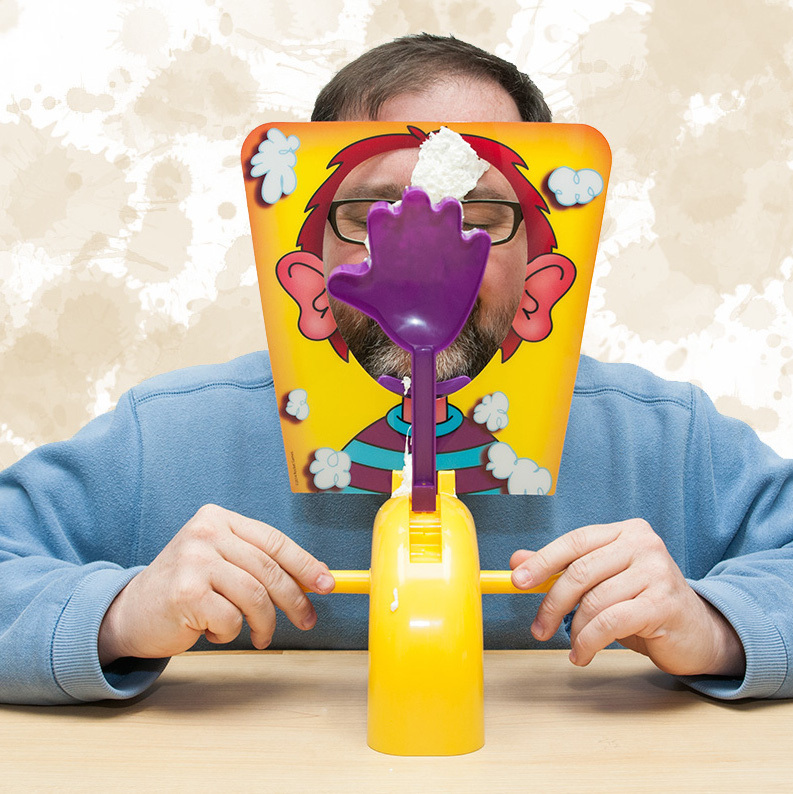 To get started, players attach the purple Chin Rest and Splash Card Mask to the Pie Thrower base, which comprises two handles and a throwing arm in the shape of a hand. After setting the throwing arm in place, you add the pièce de résistance: a dollop of whipped cream from your kitchen. Pengoloo is a fun game that encourages memory and color recognition. 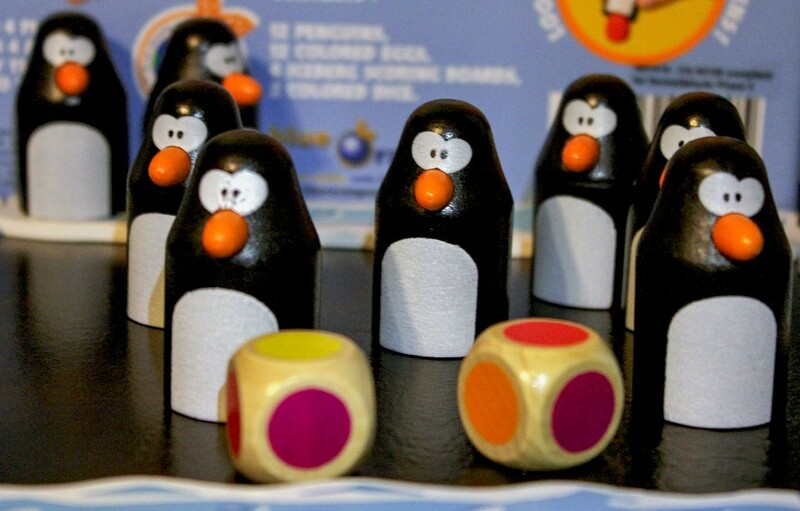 Young players will love the game design, with 12 adorable penguin characters and colored eggs (6 colors, 2 of each). The penguins are hollowed out wood pieces that sit on top of the eggs to hide them. 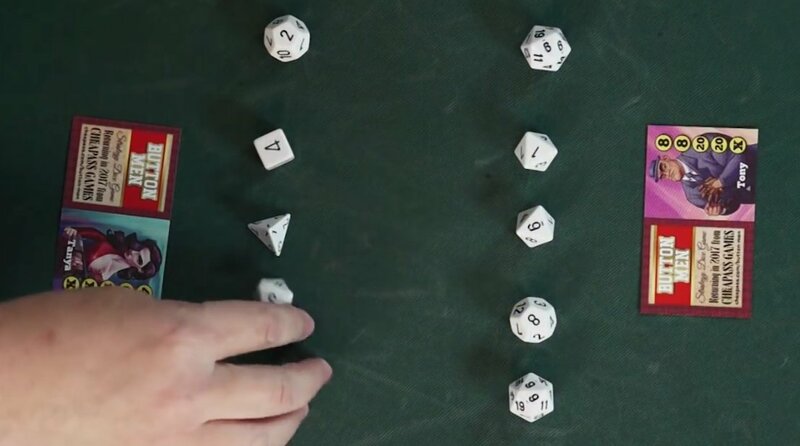 Players take turns rolling two colored dice to determine what color they’re looking for. Then they pick up two penguins to see if the eggs underneath match the dice. You put matching penguins on your iceberg scoreboard; the winner is the first player to fill their iceberg (or whoever has the most after all the penguins have been picked). The game gets more fun as you try to memorize egg locations to gain an advantage. Both kids and adults will enjoy Pengoloo. Kids get a kick out of the cute little penguins and the thrill of finding the right color egg. Even children who don’t fully grasp the memory aspects of the game will enjoy playing with the penguins. Adults will like playing a game without having to compensate for their child’s lack of skill; luck is just as important as memory and it’s entirely possible for your child to win just by picking up penguins at random. This makes the game enjoyable for children of all ages and skill levels. 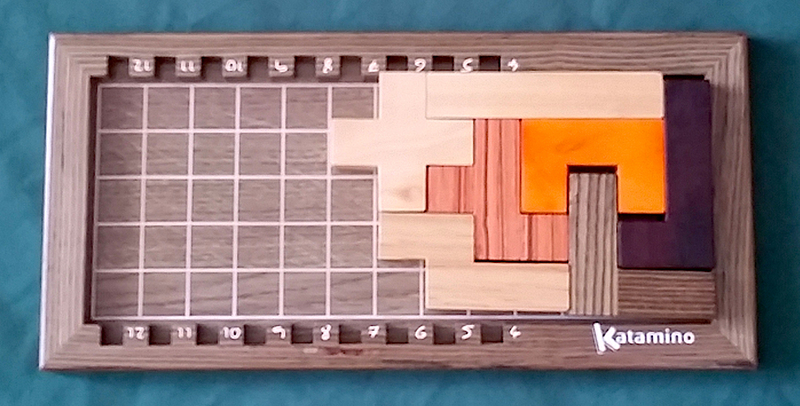 Katamino is a wooden puzzle and board game that can be played solo (puzzle) or with two players (puzzle game). 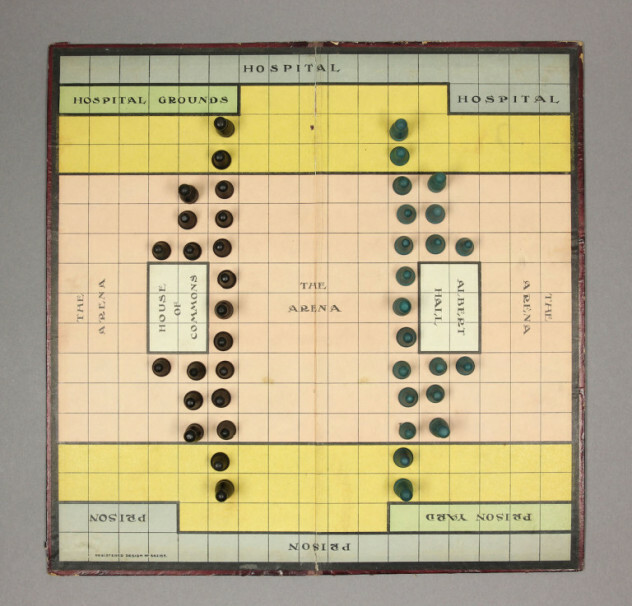 As a two-person game, players must arrange the twelve different shaped blocks – pentaminos [same as pentomino, but this is how Katamino spells it] – so that they fit and completely cover the grid on the board, which can be adjusted in length before the game starts. Players take turns fitting the pentaminos over the squares until one player can no longer fit a piece. The game is simple, quick and challenging. The wooden pieces are high quality and beautiful enough to keep out on display. I am not much of a window shopper myself, but was amazed by this puzzle game from the moment I saw it. I spent quite a while working the puzzle in the store before I went ahead and purchased it. With over thousands of possible combinations and a handful of variations to play the game, I'd say Katamino satisfies the requisite for a must-have puzzle game for anyone who's up for a challenge. Pocket Imperium is a surprisingly big game in a very small box. 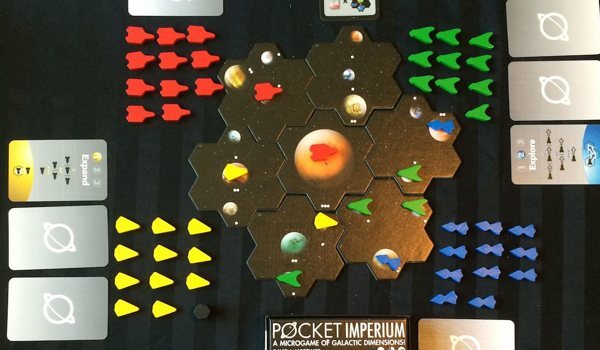 The “Pocket” in its name refers to its microgame stature, while “Imperium” offers a clue to its galaxy-spanning scale and 4X game mechanic (eXplore, eXpand, eXploit, eXterminate), popular among galactic empire games. The first thing you notice about Pocket Imperium is the quality of its components. The box and art are lovely, as are the command cards and seven main “sector tiles” (the game board). The game also comes with 52 brightly colored wooden spaceship markers in four designs. There's a lot stuffed into this box, and with everything placed on the table, it really makes for a satisfying game spread. But at $40, you do pay for all this. The history of Communism intrigues me. I have traveled to and worked with game development companies in Russia, China, and Hungary. When I was growing up, I visited the Berlin Wall where my Father was stationed – he later spent time in the military on both the borders of then South Vietnam and South Korea. Queue succeeds where Monopoly failed in two distinct areas. Monopoly was originally designed to illustrate the pitfalls of capitalism, but gameplay actually rewards it. And, let’s all be honest, Monopoly, is not the most fun game in our collections. Queue is both fun and successfully educates the player on some of the inherent problems of communism. 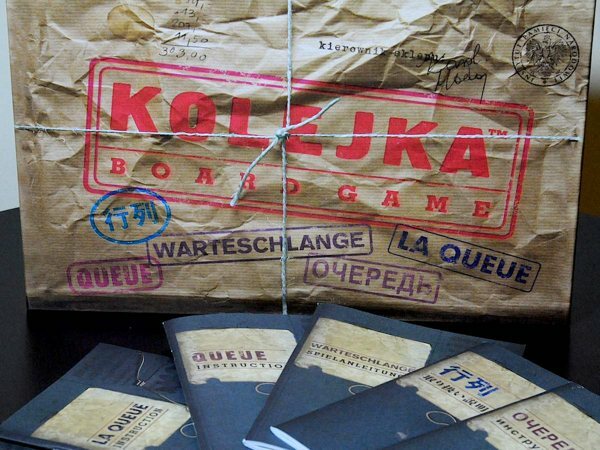 Queue was created by the Polish Institute of National Remembrance to ensure that a small portion of what it was like to live under Communist rule in the 1980s was kept alive. Specifically what is it like to shop in a country where production is controlled by the state and not the free market. For the MTV generation, you may remember that was the time of Solidarity/ Solidarność and Lech Walesa. You may have had a red and white pin with their logo on your jacket next to those of The Clash and Give Whirled Peas a Chance.